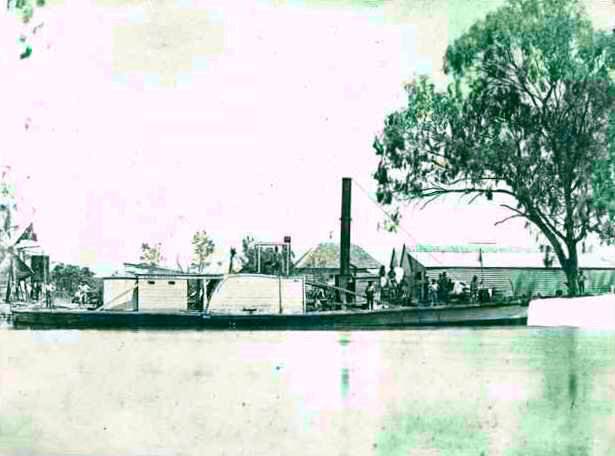 September 17 marks the maiden voyage of the first paddle-steamer down the Murray River, in 1853. The Murray is Australia’s longest river at 2508 km long; it has its source in the Alps, meanders across the southern inland plains where it forms most of the border between Victoria and New South Wales, and ends at Lake Alexandrina in South Australia, which empties into the Southern Ocean near Goolwa. Europeans first discovered the Murray in 1824, and Captain Charles Sturt became the first explorer to follow the river’s course down to Lake Alexandrina, in 1828-29. In 1851, the South Australian government offered 2000 pounds reward to the first steamship to reach the junction of the Murray and Darling Rivers, at Wentworth. The Scottish explorer Francis Cadell, who had already navigated part of the Amazon and sailed to China and Singapore by this time, heard about the reward in 1852. Nobody had claimed the money yet, and Cadell was determined to give it a shot. He had a steamer built in Sydney, and during its construction, did a test run on the Murray in a canvas boat. Just to make things more exciting, a British-born Australian named William Randell who had lived near the Murray River also threw his hat in the ring. He built his own steamboat in 1852, even though he had no experience in boat construction, and had never seen a paddle-steamer before. He was the first person to actually put a steamboat in the river. Randell didn’t even know about the reward until later – it was a personal goal. Cadell had much greater flair for public relations. While Randell named his craft Mary Ann after his mother, Cadell cannily called his the Lady Augusta, in honour of the South Australian governor’s wife, Lady Augusta Sophia Young (the town of Port Augusta in South Australia is also named after this lady). On the Lady Augusta‘s maiden voyage, Cadell took as his passengers the governor and his wife, members of the Legislative Council, and a journalist to give him a good write-up. Cadell set out from Goolwa on August 25 1853. For most of the way he and Randell were neck-and-neck; however, on September 17, the Lady Augusta arrived in Swan Hill a few hours before the Mary Ann. Swan Hill is 1000 miles from the sea, and although they were still ages from Wentworth, the governor decided the contest was over, and Cadell had won. He was deemed the first person to successfully navigate the Murray River in a practicable steamboat, and the governor arranged for gold medals to be awarded to Cadell, the Legislative Council, and himself. He then gave Cadell another 2000 pounds to build another boat. William Randell kept going, and although he didn’t reach Wentworth either, he went further than Cadell. Due to a general feeling that Randell had been treated unjustly, he was given 300 pounds, and then another 400 when public sentiment continued to mutter about it. In fact neither Cadell or Randell had fulfilled the requirements of the contest, and this must surely rank as one of the unfairest competitions of all time. Both Francis Cadell and William Randell attracted investors and went into business running steamships on the Murray, and because of their efforts, the Murray was opened up as an avenue of transportation. Perhaps it doesn’t really matter that Francis Cadell was the first official steamboat navigator of the Murray River in the Lady Augusta. I still think it stinks though. Augusta is the feminine form of Augustus, from the Latin for “great, venerable, majestic”. Just as Augustus was used as a title by the Roman emperors, Augusta was a title bestowed upon some women attached to the imperial families of Rome and the Greek dynasties. It was the highest honour that could be conferred, signalling not only power, but a goddess-like status – indeed, many goddesses were given the title of Augusta. The first woman to receive the title was Livia Drusilla, the widow of the Emperor Augustus, who became known as Julia Augusta. By all accounts she was very proud and regal, with a commanding personality. She had a lot of political influence, and enjoyed wielding power and being showered with honours. She was a direct ancestor of a dynasty of emperors, including Tiberius (her son), Caligula, Claudius and Nero. The name Augusta was introduced to Britain in the 18th century through the Hanoverian rulers. George III gave the name Augusta to his sixth child and second daughter, Augusta Sophia. The town of Augusta on Western Australia’s south-west coast is named after her, and I fancy that Lady Augusta might have been too. Princess Augusta was named after her grandmother, Princess Augusta of Saxe-Gotha – Augusta, Georgia, in the United States, which hosts The Masters golf tournament, is named after her. Augusta has been a traditional name in the British royal family, and was common amongst the aristocracy. However, we often think of it as a comically “difficult” old lady name. Oscar Wilde may have begun it, in his comedy, The Importance of Being Earnest, where Lady Bracknell is the main characters’ haughty Aunt Augusta. Growing up, it seemed that every second children’s book had an Aunt Augusta in it, who would be crabby, or eccentric, or snooty, or fun-suppressing. The name almost seemed to be code for such an aunt, in the same way you would expect a fictional lab assistant named Igor to be hunch-backed and attached to a mad scientist. J.K. Rowling followed this English kidlit tradition by giving Neville Longbottom a dominating, hard-to-please grandma named Augusta. And before I could even read anything much, life followed (or preceded?) art by giving me a Great Aunt Augusta who, in true literary fashion, was stern and austere, hated noise, mess and light, thought that children should be neither seen or heard, and scared the stuffing out of me when I was four. For ages it didn’t seem possible to me that you could name a baby Augusta; it didn’t seem so much an “old lady name” as an “old bag name”. But Augusta was once an elegant young lady’s name, and could be again. With August a stylish choice for boys and girls, and Gus a fashionable name for boys, Augusta’s chances look better than they have in a long time. Augusta isn’t the right choice for me as a family name, but maybe it is for you. Maybe your Great-Aunt Augusta was warm and loving and made you cinnamon buns, or cool and funny and gave you rides on her motorbike, you lucky punk. Point is, it could be the perfect name for someone else. Augusta is a rare vintage name which still seems patrician and dignified, but comes with spunky nicknames Gus and Gussie, and the quirky Augie and Oggy. It would also make a sensational middle name. I don’t think Augusta’s everyone cup of tea and biscuit, but I imagine those who are drawn to it would be passionate supporters. You can’t fall halfheartedly in love with Augusta – she’s too strong for that. Note: The name combinations are from Australian historical records, while the siblings are from the British royal family. POLL RESULT: Augusta received an approval rating of 77%. 29% of people loved the name, and a further 29% liked it.